Russian President orders United States to cut 755 diplomatic staff in Russia, in response to new sanctions against his country. 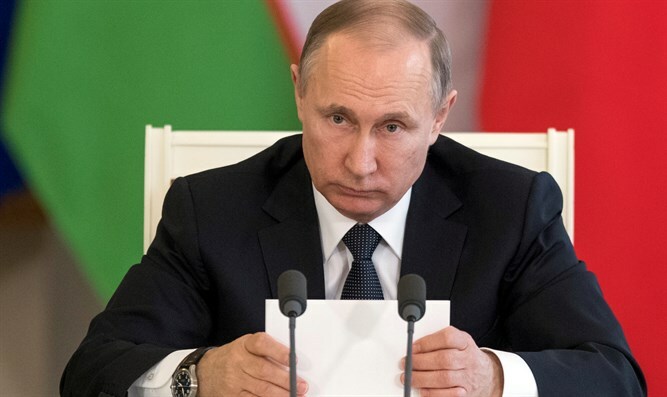 Russian President Vladimir Putin on Sunday said the United States would have to cut 755 diplomatic staff in Russia, AFP reported. His announcement came after Congress backed new sanctions against the Kremlin. On Thursday, the Senate approved a bill imposing sanctions on Russia, North Korea and Iran by an overwhelming majority of 98-2. In response, the Russian foreign ministry demanded Washington cut its diplomatic presence in Russia by September 1 to 455 people, the same number Moscow has in the U.S.
"More than a thousand people -- diplomats and technical personnel -- were working and are still working" at the U.S. embassy and consulates, Putin said Sunday in an interview with Rossia-24 television. "755 people must stop their activities in Russia," he added. The U.S. State Department, asked for a response by AFP, said it did not comment on "the number" of U.S. officials serving abroad. The legislation approved on Thursday has been sent to President Donald Trump for him to sign into law. While the White House originally objected to this part of the law, Trump indicated on Friday he would sign the package into law. Putin on Sunday warned that Russia could further ratchet up the pressure, but he hoped this would not be needed. If the damage inflicted by "attempts to pressure Russia" rises further, "we are able to look at other forms of retaliation. But I hope we won't have to do it," added Putin.